Reeniop41 wrote: This will be the first Bluray to Bluray upgrade! Yeah forgot about that and I stand corrected although there were mixed feelings about the 4K restoration on the newer version in the Tati Box Set. 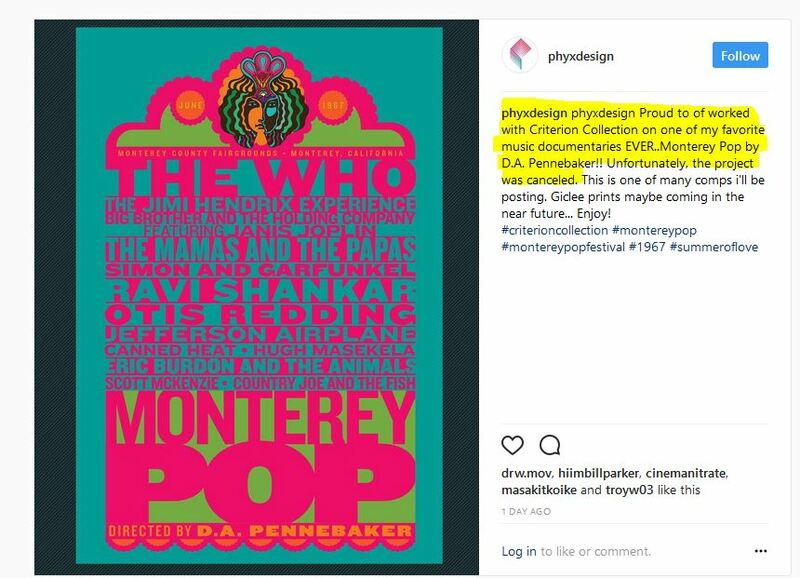 Maybe The Complete Monterey Pop Festival will be the 1st Criterion UHD disc/s! But definitely the first Bluray boxset to Bluray boxset upgrade to commemorate its 50th anniversary. I've seen the restoration at IFC. My one complaint would be the grading on Cass Elliot's reaction shots during Janis Joplin's "Ball and Chain." That scene in general is tough to grade because they shot it with the aperture too open so not only are Joplin's shots blown out but the color on her was thrown off. It looks like the footage on Joplin may have been improved on the restoration by a fair margin but for some reason Elliot's reaction shots now look wrong, like you're looking at her through a strong pair of polarized shades. On the current 2009 Criterion BD, Elliot looks fine, with the color and exposure being in perfect balance. Is there any chance (some info?) about more footage available (the outtakes) ? And I wouldn't complain about Janis Joplin with Big Brother complete concert (as well as the Who). But did D.A Pennebaker kept all these reels ? I was already so surprised and pleased to discover so many bands when Criterion release Monterey on DVD with the DVD "outtakes". There must be more outtakes available. Whether they can be legally released is another matter. Two clips that show up in atrocious quality on youtube are Pictures of Lily (THE WHO) amd Viola Lee Blues (GRATEFUL DEAD). Does anyone know of other unreleased takes? charal wrote: There must be more outtakes available. Whether they can be legally released is another matter. Two clips that show up in atrocious quality on youtube are Pictures of Lily (THE WHO) amd Viola Lee Blues (GRATEFUL DEAD). Does anyone know of other unreleased takes? Can anyone explain why this is up for a re-release? Or why people assume it is? aox wrote: Can anyone explain why this is up for a re-release? Or why people assume it is? See the posts on the previous page? No, I did not. Thanks. EDIT: Although, I see I have in the past. Must have slipped my mind. Been a long day. Apologies. There will be a new BD boxset of all of the films, as well as new BD and DVD standalones of the main feature. Is The Complete Monterey Pop the first official upgrade of a Blu-ray release from Criterion? I was hoping for a standalone of the film itself (so I wouldn't have to buy the whole box set all over again), but alas. There is a standalone rerelease as well. So, it looks like only Monterrey Pop itself is getting upgraded? Ribs wrote: There is a standalone rerelease as well. Michael Kerpan wrote: So, it looks like only Monterrey Pop itself is getting upgraded? I wrote to Criterion about this and they pretty much said only the original feature was restored. So, that's really the only "upgrade" here? With the promise of "More!". they were not in 1080p24 contrary to the main movie "Monterey", "just" "i" but still the picture was really good. Gotta save something for the re-re-rerelease. It is, however, the first time they specifically re-release / upgrade an individual BD release. Playtime was re-released as part of the Tati set, which was a whole deal, but it still isn't accessible in the US in an other manner. This is different. Last edited by tenia on Sat Sep 16, 2017 12:32 pm, edited 1 time in total. It remains to be seen which answer the Jeopardy judges will go with. I know it's always been one of the extras but I think it's really cool there is film of The Blues Project playing "Flute Thing" here. That's one of my favorite 60's rock instrumentals.